There was a time in human history known as the Dark Ages. The Roman Empire had fallen apart; ostensibly, to start a chain of pizza joints in somewhere like New Jersey. Barbarians roamed the land, and no one took any selfies or posted their status on Facebook, which meant historians actually have very little information about this era. However, there eventually was a Renaissance; a time when humanity emerged from the dark, began “liking” things and everyone generally began to co-exist in relative harmony once again. Those of us who have been around long enough can remember a more recent Dark Age in terms of cars. It was a time when men in flowing robes controlled the price of oil, forced us to line up at the gas pumps and many pizza joints in New Jersey were forced to close. It also forced the entire automotive industry to retool and rethink what they offered for us to drive on the road. We needed to save gas, and later even Mother Earth. Prior to the automotive Dark Ages cars like the Cadillac were the prefect symbol of everything American. Big, brash, oozing with luxury, the huge Cadillacs could once be seen taking up an entire lane while gulping fuel like a survivor on a desert island who finds fresh water. 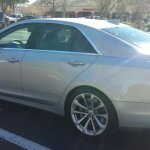 These were the times when owning a Cadillac meant something; you had arrived. You could now afford the finer things in life, fur coats, diamonds, martinis for lunch and a big Caddy in the driveway of your large suburban house. Later of course owning a Cadillac meant you were simply old, but still rich. However when the Dark Age fell upon us the Cadillac crept into the shadows. Big was bad and Cadillac soon fell out of favor. GM tried to keep the Caddy relevant during that Dark Age. The Deville shrunk, the Eldorado trimmed up and GM even threw out the forgettable compact called the Cimarron (which was really a rebadged Chevy Cavalier and an example of everything that was wrong with the automotive industry in America during that dark, dark time). 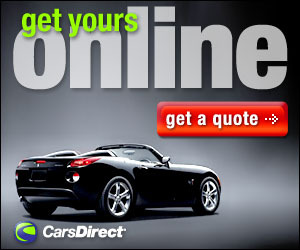 With the dawn of the 21st Century though things at GM, Cadillac and indeed the entire industry began to change. We were emerging from the Dark Ages, cars were starting to be fun again. Someday historians may point to this time as a new Renaissance; a new era when we have come out of the dark and back into the light. 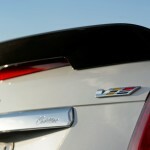 Cadillac has been one of the leaders of this new age. 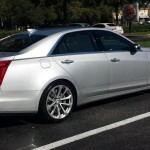 With their new “Art and Science” philosophy, they have produced cars that have made the Caddy relevant once again and the CTS is perhaps their best example of this renaissance. Introduced near the turn of the Century, the CTS embodied all the things GM was trying to do with the aging Cadillac brand. It was indeed fresh, new and now in its third Generation shows no signs of losing its relevancy. 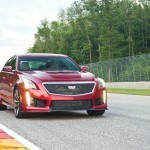 In 2004 the high performance variant, the CTS-V, debuted and soon America was competing alongside the Audi’s BMW’s and Mercedes AMG models. 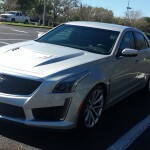 2016 marks the debut if the third generation of the CTS-V. We recently had one to live with for a week. And what a great week it was. 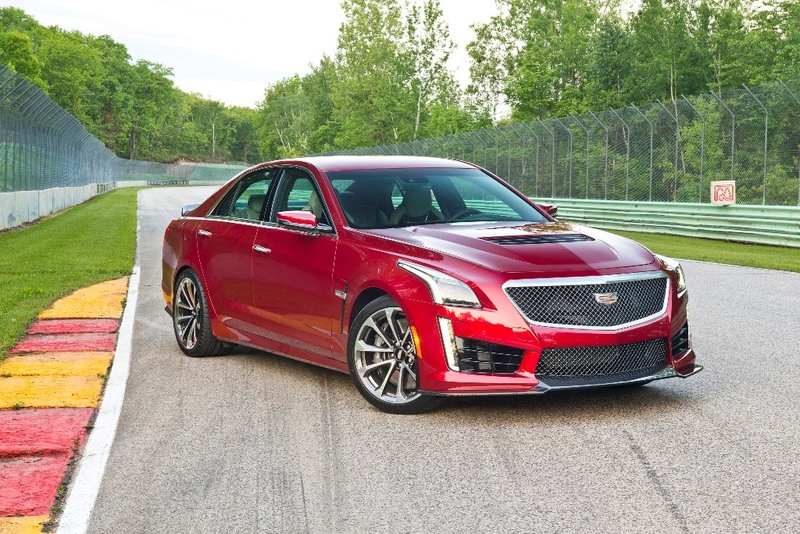 The CTS-V is a luxury sedan with a 640-horsepower supercharged V8 engine (the most powerful Caddy every built), a bit stiffer body, new and improved steering and suspension and a refreshed interior. This high performance sedan is at home on a racetrack or a daily commute, achieving 0-60 in 3.6 seconds while emitting a satisfying growl with four adults swaddled in luxurious comfort inside. 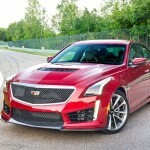 Being a Cadillac, the CTS-V has only one trim level and only a few options. 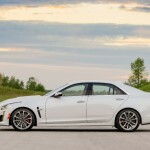 Those few options are really not needed as the CTS-V comes loaded with standard equipment that is really too long to list (that list however can be found here). Among the highlights of the standard equipment are Brembo brakes, adaptive magnetic suspension dampers, an electronically controlled rear differential, xenon headlights, and automatic high-beam headlight control. We had the optional Recaro bucket seats, heated, and covered in leather and suede microfiber with more adjustments than you’ll possibly ever need (16 to be exact). The electronic, high-definition dash is configurable and has a heads-up display. There is also a rearview camera and a front curb-view camera that provides a nice low-level view that helps avoid those annoying sounding scrapes, along with lane keeping assist and blind spot monitoring. Of course standard is remote engine start, OnStar an upgraded Cadillac User Experience (CUE) infotainment system with navigation accessed via an 8-inch touch screen and a 13-speaker Bose surround-sound audio system with satellite and HD radio. Our tester for the week had one of the few options available: The Luxury package gives you three-zone climate control, heated and folding rear seats, a rear window power sunshade, manual rear side window sunshades and a 110-volt household-style power outlet. We didn’t have the sunroof which is an option available only with the Luxury package. We did have the optional performance data and camera data recorder that will record and play back the fun you can have on a racetrack. The look of the CTS-V can be enhanced with an optional Carbon Fiber package meant to generate increased downforce and adds a hood vent, rear spoiler, front air splitter and rear air diffuser all made of carbon-fiber weave. Our tester didn’t have this but with a nicely sculpted ventilated hood, side air vents and just a hint of a rear lip spoiler, looked great. 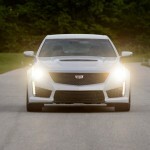 On the road the CTS-V has been characterized as a four-door Corvette and for good reason. The 6.2-liter V8 engine is the same as found in the Z06 and on paper is only slightly less powerful (640 hp and 630 pound-feet of torque, while the Corvette’s numbers are 650 hp and 650 lb-ft of torque). The CTS-V is of course a bit heavier (4145 lbs curb weight opposed to the 3524 lbs of the Z06) so on the road the CTS-V doesn’t rival its Corvette cuz but that doesn’t mean the CTS-V is a wimp; far from it. 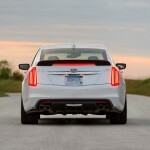 On the road, the CTS-V has more power than you will ever need for everyday driving. There are four driving modes (Touring, Sport, Track that includes five sub-modes, and Snow/Ice). Unlike some of the other high performance sedans we’ve tested the power in the CTS-V seems a bit more restrained, as if holding back. That’s not necessarily a bad thing; too much power in the wrong hands can be a dangerous thing. 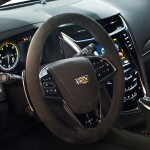 The restraint of the CTS-V for everyday driving will allow most drivers the control that will allow the rest of us a bit less nervousness when around them on the road. That power can be unleashed in the Sport and Track mode however. We, sadly, didn’t get any track time during our week, but an open stretch of deserted road allowed a few blissful miles in both Sport and Track mode and gave us a sense of just what this great machine is capable of when fully unleashed. 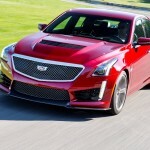 For everyday use, which is what most of us will use the CTS-V for, this is easily at the top of our high-performance luxury sedan list. 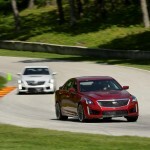 We’ve tested most of the others, the AMGs, the Audis, BMW M5 and the week prior to the CTS-V a 2016 M6. 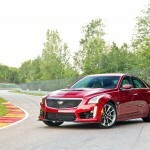 The CTS-V has more power than both the Mercedes and the M series, and key in our opinion, a great deal more interior room. 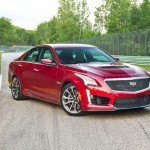 Since its introduction, GM has worked tirelessly on making the CTS-V a car that will rival any of its European competitors. With this new generation, we don’t think they have done that; no they now have surpassed it. While many of the European lovers may disagree, most can agree that it’s been many years since an American product has been talked about on the same level. 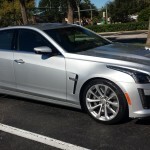 The 2016 Cadillac CTS-V is evidence that the Dark Ages are behind us, the Renaissance has arrived and the formerly mighty Caddy is once again relevant.